Tea is the second most widely consumed beverage after water globally, with 3 billion kilograms of annual production and consumption; it is gained by some processes on Camellia sinensis plant., Black tea, oolong tea, and green tea are three types of tea categorized according to the fermentation rate. Black tea is the final product when C. sinensis leaves are fermented, oolong tea is gained by partial fermentation, and green tea is produced without fermentation. Green tea production starts with steaming fresh C. sinensis leaves to prevent fermentation. This step deactivates the enzymes decomposing the color pigments of leaves, leading to preservation of green color of tea during the next steps as well as retention of natural polyphenols. Polyphenolic catechins of green tea – a group of its active compounds – include epicatechin gallate, epicatechin, epigallocatechin, and epigallocatechin gallate (EGCG). Different oral health-related effects have been reported for the active components of green tea. Oral cancer chemoprevention has been attributed to EGCG, which has the highest concentration and activity among the other catechins of green tea.,, Green tea has also other beneficial effects in the oral cavity including reducing the bleeding time after tooth extraction, antibacterial activity against the bacteria responsible for periodontal disease and dental caries, reducing periodontal disease, anticariogenic activity, and reducing halitosis. Halitosis is the condition of unpleasant odor due to complex odorous substances in the breath. Up to 50% of the people around the world find themselves with oral malodor steadily or in recurrent episodes. Halitosis is divided into intraoral and extraoral types. Intraoral halitosis is more common than extraoral type; however, extraoral treatment is more complicated, and patients should be referred to medical specialists (physicians)., Probable contribution of several bacterial species (mainly Gram-negative anaerobes) to intraoral halitosis instead of a single specific species has been reported. Volatile sulfur compounds (VSCs), diamines, and short-chain fatty acids (agents mainly causing oral malodor) are products of methionine, cystine, and cysteine metabolism as precursors of bacterial metabolism., Some of the studies have suggested the effective role of green tea extracts in halitosis. The potential mechanisms of this product in reduction of halitosis might be attributed to the possibly suppressive role of EGCG in production of methyl mercapthane as well as antibacterial activity of tannin., In case of acceptable effects on halitosis, this medicament can be a good suggestion for halitosis treatment, which can enhance the patients' acceptance, motivation, and cooperation. In addition to its reputation for other therapeutic effects, it is available, easy, and cheap to prepare and has good taste. Patients can prepare and use it at home daily. Therefore, the aim of this study is to evaluate the clinical effect of green tea on halitosis through a systematic review of available literature. This study is approving by research and ethics committee of University of Medical Sciences (No: 296030). We included randomized controlled trials (RCTs) and quasi-RCTs which investigated the effect of green tea on oral malodor. They had to have a green tea intervention group and a control group in their study groups. We just included research articles written in English language. The participants of studies suffered from physiologic intraoral malodor (halitosis not associated with respiratory or gastrointestinal problems or periodontal disease and xerostomia) and were of any age groups and of both genders. Green tea was used as mouth rinse or just as pure extract. VSCs were measured by gas chromatography machine or portable sulfide monitors. The studies excluded from the review in which green tea was not used in oral environment and was just utilized in patient's specimens such as saliva. Electronic search was conducted in PubMed (July 11, 2016), Cochrane (July 11, 2016), ProQuest (Full Text Dissertations and Theses: Health and Medicine, Nursing, and Allied Health Source) (2000–July 2016), and Google Scholar (July 2016) databases. Details of search strategy are presented in [Table 1]. The studies were selected according to their titles and abstracts; if some criteria could not be evaluated by abstracts, the full texts of articles were checked. Details of each selected article were presented in the table including author's name, publication year, study design, study method, participants' characteristics, outcome, and main results. To score the selected articles, 27 items of CONSORT 2010 checklist were considered. Each article was reviewed by all authors to investigate whether the item was accomplished in the study or not. If the item was accomplished, one point was given to the article; if it was not done or mentioned, zero point was given to the article. Finally, the scores of each article were summed, and according to the final score, they were classified as high quality (19–27 score), average quality (10–18 score), and low quality (0-9 score). The low, average, and high-quality articles were included in the study. Possible oral side effects including xerostomia, burning sensation, changes in taste perception, tooth staining, mucosal irritation, and its systemic adverse effects including irritability, tachycardia, and insomnia were also reported. None of the 12 articles were obtained through Cochrane library, and 85 articles obtained through ProQuest (Full-Text Dissertations and Theses: Health and Medicine, Nursing, and Allied Health Source) met the inclusion criteria. Three hundred and five articles were obtained by searching Google Scholar, three of which fulfilled the inclusion criteria. Two of the articles were omitted because they were duplicated. The third article was excluded because the green tea mouthwash was used on saliva specimens instead of oral environment. Searching in Scopus database yielded 270 articles, only two of which met the inclusion criteria, but these two articles were duplicated too. Details of database searching are presented in [Table 1]. The study design, participants' characteristics, outcome, main results of the two eligible articles, and score given to each article according to CONSORT 2010 checklist are summarized in [Table 2]. The first article was performed by Farina et al. They evaluated the effect of the medicinal plants Curcuma zedoaria and C. sinensis on halitosis in thirty volunteer adults of both sexes, aged 19–43 years. Green tea was administered as 10 mL mouthwash for 30 s. VSC was measured by a halimeter before, 1 min, 90 min, and 180 min after consumption of green tea mouthwash, and the outcome was compared with the placebo group (water). Details of the study method of articles are presented in [Table 1]. One minute after the mouthwash was used, a reduction occurred in VSC level, which was similar to water and green tea mouthwash. After 90 and 180 min, VSC level similarly increased in both groups. The second article was carried out by Rassameemasmaung et al. Sixty participants recruited in this study were stratified according to their VSC levels. Participants in each stratum were randomly divided into green tea mouthwash and placebo group. VSC level was measured by portable sulfide monitor, and then 15 ml of green tea mouthwash was used for 1 min. VSC level was measured 30 min and 3 h later. The assigned mouthwashes were used twice daily with a specific protocol for 4 weeks. In 30 min and 3 h periods, the result showed that green tea significantly reduced VSC compared to baseline, and it was more effective than placebo; however, it was not statistically significant. However, after 28 days, differences were significant for green tea group in comparison with baseline and control group. In addition to the importance of halitosis control for its bad effect on social communications, the causative VSCs in halitosis are important to be reduced because of their ability to initiate and accelerate periodontal disease. These active agents harm the gingival fibroblast DNA and cause cellular apoptosis; they also prevent osteoblastic activity and osteoclastic activity. Green tea has been used widely as a medical herb since ancient time. In some cultures such as Chinese, it is believed that green tea has some paregoric effects on headache and general aches. The positive impacts of green tea on periodontal disease and halitosis have been shown in some studies.,, To find the clinical effect of green tea on halitosis, the current study systematically reviewed the available papers on the ability of green tea in overcoming halitosis. Based on the online databases, 714 articles related to green tea and halitosis were found in the primary search, only two of which met the inclusion criteria. The study conducted by Rassameemasmaung et al. was ranked a high-quality study; whereas the study by Farina et al. gained an average quality. This ranking (according to CONSORT 2010 checklist) shows that the study method employed by Rassameemasmaung S was closer to the standards of clinical trials. As shown in the included articles, the early effect of green tea mouthwash, in comparison with baseline, was statistically significant. There are some other in vivo and in vitro studies that support the effectiveness of green tea on reducing halitosis. Zeng et al. in their in vitro study showed the ability of green tea to remove odorant sulfurs. They showed the intensifying effect of adding herbal acetone powder to green tea in reducing halitosis (Zeng et al., 2010). The results of Lodhia et al. support the adverse effect of green tea on oral malodor. According to this in vivo study, green tea reduced hydrogen sulfide (H2S) and methyl mercaptan (CH3SH) concentration specifically after consumption. It is important because CH3SH is related more to halitosis rather than H2S. The deodorizing mechanism of EGCG is based on reaction with CH3SH, in which methylthio and/or a methylsulfinyl group reacts with the B ring of EGCG. In this process, a methylthio group is added to the orthoquinone form of catechin (oxidated with atmospheric oxygen) and results in a reduction of bad odor (Yasuda et al., 1995). Furthermore, green tea contains zinc, which can be considered one of the possible ingredients contributing to its antihalitosis effects. It affects VSCss and converts them to nonmalodorous compounds., It has been reported that the mouthwash-containing zinc can reduce VSCs by about 80% for 3 h. However, the zinc content of green tea varies in different green teas species. Therefore, considering the green tea with a high concentration of zinc may result in more antihalitosis effects. It should be noted that, although the first study showed early reduction in halitosis in the green tea group, it was similar to the control group. This finding can be justified by the rinsing effect of mouthwashes regardless of their components. It has also been reported that EGCG and green tea can decrease adhesion of S. moorei and Porphyromonas gingivalis to oral epithelial cells., The tannin content of green tea is considered a biosynthetic antimicrobial agent. In the study conducted by Moghbel et al., green tea mouthwashes with a higher amount of tannin showed more powerful bacterial colonies. Generally, according to the two included articles, it seems that green tea has the ability to reduce VSCs. Based on the high CONSORT score reported by Rassameemasmaung et al., green tea can be suggested to have possibly long-term effect on oral malodor. Although considering green tea mouthwash as a certain medicament for halitosis control needs more randomized clinical trials with sufficient volunteers, it can be suggested to patients as an auxiliary treatment beside other treatments. Green tea mouthwash can reduce halitosis. This effect can be attributed to its rinsing activity as a mouthwash as well as the antimicrobial mechanisms of green tea itself. This study does not support the clinical prescription of green tea for certain treatments due to lack of enough randomized clinical studies, but green tea mouthwash can be a good treatment of choice beside other halitosis treatments to achieve better clinical results. This study was supported by the Department of Oral Public Health, Isfahan Dental School, Isfahan, Iran. This study was supported by the Deputy of Research of Isfahan University of Medical Sciences. Yang CS, Landau JM. Effects of tea consumption on nutrition and health. J Nutr 2000;130:2409-12. Gaur S, Agnihotri R. Green tea: A novel functional food for the oral health of older adults. Geriatr Gerontol Int 2014;14:238-50. Baskar S. Role of green tea in dental problems. Int J Cur Res Chem Pharm Sci 2014;1:73-7. Iriti M, Varoni EM. Chemopreventive potential of flavonoids in oral squamous cell carcinoma in human studies. Nutrients 2013;5:2564-76. Wu AH, Yu MC. Tea, hormone-related cancers and endogenous hormone levels. Mol Nutr Food Res 2006;50:160-9. Bailey S. A Comparative Study of White, Black and Green tea Solutions as Potential Antiviral Agents in Rhesus Monkey Kidney Cells Induced with Porcine Rotavirus. University of Illinois at Urbana-Champaign; 2014. Soltani R, Haghighat A, Fanaei M, Asghari G. Evaluation of the effect of green tea extract on the prevention of gingival bleeding after posterior mandibular teeth extraction: A randomized controlled trial. Evid Based Complement Alternat Med 2014;2014:857651. Araghizadeh A, Kohanteb J, Fani MM. Inhibitory activity of green tea (Camellia sinensis) extract on some clinically isolated cariogenic and periodontopathic bacteria. Med Princ Pract 2013;22:368-72. Kushiyama M, Shimazaki Y, Murakami M, Yamashita Y. Relationship between intake of green tea and periodontal disease. J Periodontol 2009;80:372-7. Hamilton-Miller J. A review of clinical trials of probiotics in the management of inflammatory bowel disease. Infect Dis Rev 2001;3:83-7. Rassameemasmaung S, Phusudsawang P, Sangalungkarn V. Effect of green tea mouthwash on oral malodor. ISRN Prev Med 2013;2013:975148. Hine MK. Halitosis. J Am Dent Assoc 1957;55:37-46. Murata T, Yamaga T, Iida T, Miyazaki H, Yaegaki K. Classification and examination of halitosis. Int Dent J 2002;52 Suppl 3:181-6. Yaegaki K, Coil JM. Genuine halitosis, pseudo-halitosis, and halitophobia: Classification, diagnosis, and treatment. Compend Contin Educ Dent 2000;21:880-6, 888-9. Krespi YP, Shrime MG, Kacker A. The relationship between oral malodor and volatile sulfur compound-producing bacteria. Otolaryngol Head Neck Surg 2006;135:671-6. Tonzetich J, Kestenbaum RC. Odour production by human salivary fractions and plaque. Arch Oral Biol 1969;14:815-27. Xu X, Zhou XD, Wu CD. Tea catechin EGCg suppresses the mgl gene associated with halitosis. J Dent Res 2010;89:1304-8. Moghbel A, Farjzadeh A, Aghel N, Agheli H, Raisi N. The effect of green tea on prevention of mouth bacterial infection, halitosis, and plaque formation on teeth. Iran J Toxicol 2011;5:502-15. DerMarderosian A, editor. Guide to Popular Natural Products. 1st ed: St. Louis: Mosby Co.; 1999. Farina VH, Lima AP, Balducci I, Brandão AA. Effects of the medicinal plants Curcuma zedoaria and Camellia sinensis on halitosis control. Braz Oral Res 2012;26:523-9.
de Jongh A, van Wijk AJ, Horstman M, de Baat C. Attitudes towards individuals with halitosis: An online cross sectional survey of the Dutch general population. Br Dent J 2014;216:E8. Madhushankari GS, Yamunadevi A, Selvamani M, Mohan Kumar KP, Basandi PS. Halitosis – An overview: Part-I – Classification, etiology, and pathophysiology of halitosis. J Pharm Bioallied Sci 2015;7:S339-43. Imai T, Ii H, Yaegaki K, Murata T, Sato T, Kamoda T, et al. Oral malodorous compound inhibits osteoblast proliferation. J Periodontol 2009;80:2028-34. McKay DL, Blumberg JB. The role of tea in human health: An update. J Am Coll Nutr 2002;21:1-3. Lodhia P, Yaegaki K, Khakbaznejad A, Imai T, Sato T, Tanaka T, et al. Effect of green tea on volatile sulfur compounds in mouth air. J Nutr Sci Vitaminol (Tokyo) 2008;54:89-94. Kleinberg I, Codipilly M. Modeling of the oral malodor system and methods of analysis. Quintessence Int 1999;30:357-69. Zhao L, La VD, Grenier D. Antibacterial, antiadherence, antiprotease, and anti-inflammatory activities of various tea extracts: Potential benefits for periodontal diseases. J Med Food 2013;16:428-36. Tsushida T, Takeo T. Zinc, copper, lead and cadmium contents in green tea. J Sci Food Agric 1977;28:255-8. Nachnani S. The effects of oral rinses on halitosis. J Calif Dent Assoc 1997;25:145-50. Winkel EG, Roldán S, Van Winkelhoff AJ, Herrera D, Sanz M. Clinical effects of a new mouthrinse containing chlorhexidine, cetylpyridinium chloride and zinc-lactate on oral halitosis. A dual-center, double-blind placebo-controlled study. J Clin Periodontol 2003;30:300-6. Goldberg S, Cardash H, Browning H 3rd, Sahly H, Rosenberg M. Isolation of enterobacteriaceae from the mouth and potential association with malodor. J Dent Res 1997;76:1770-5. Morin MP, Bedran TB, Fournier-Larente J, Haas B, Azelmat J, Grenier D, et al. Green tea extract and its major constituent epigallocatechin-3-gallate inhibit growth and halitosis-related properties of solobacterium moorei. BMC Complement Altern Med 2015;15:48. Haraszthy VI, Gerber D, Clark B, Moses P, Parker C, Sreenivasan PK, et al. 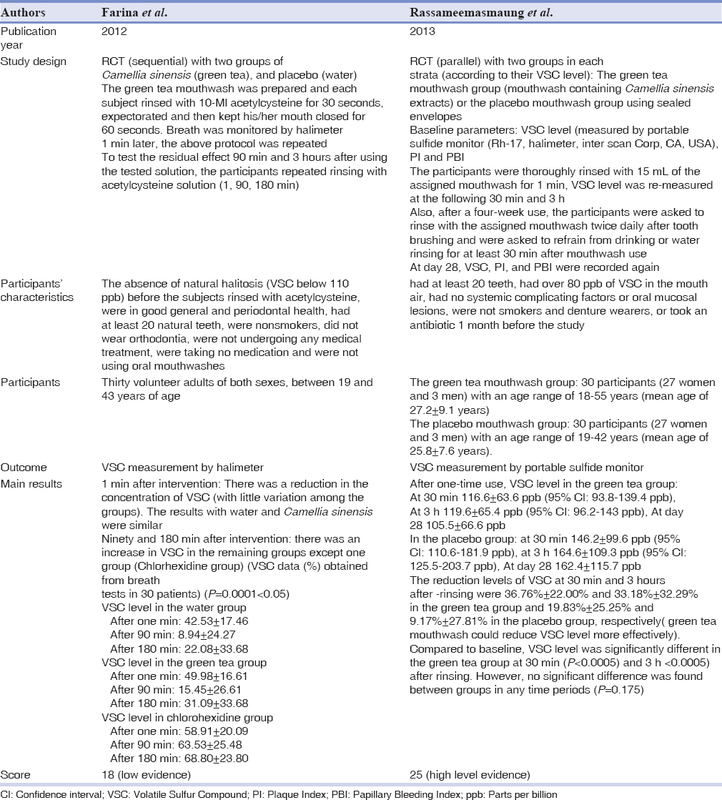 Characterization and prevalence of solobacterium moorei associated with oral halitosis. J Breath Res 2008;2:017002. Haraszthy VI, Zambon JJ, Sreenivasan PK, Zambon MM, Gerber D, Rego R, et al. Identification of oral bacterial species associated with halitosis. J Am Dent Assoc 2007;138:1113-20. Kazor CE, Mitchell PM, Lee AM, Stokes LN, Loesche WJ, Dewhirst FE, et al. Diversity of bacterial populations on the tongue dorsa of patients with halitosis and healthy patients. J Clin Microbiol 2003;41:558-63.